Before West Point: Pluckemin and the Jacobus Vanderveer House ~ The History Girl! The State of New Jersey was host to many generals and officials during the Revolutionary War. In the Raritan Valley, five generals and their staff strategically established headquarters in the homes of the well-to-do and those supporting the cause. In Bedminster, General Henry Knox took up residence in the home of Jacobus Vanderveer. Not far from the house, Knox established the first military training academy of its kind in the United States, enabling him to properly train the American forces in the art of artillery, preparing them for battle. The Vanderveer family settled in the Raritan Valley in 1743 when Jacobus Vanderveer, Sr. and his wife Catherine Unk purchased land along the east and west side of the North Branch of the Raritan River from Daniel Axtell and Lewis Johnston. Shortly after purchasing the land, Jacobus Vanderveer, Jr. was the first member of the family to be born in the Valley that same year. His parents were part of a tight-knit Dutch community centered around the Dutch Reformed Church, which maintained strong ties to their Dutch heritage and traditions. The Vanderveers resented the British and supported the Continental cause since the British had taken over the New Amsterdam Colony in 1664. About 1745, Jacobus Vanderveer, Sr. built a home for his family on the east side of the river. By the late 1750s he had built a grist and saw mill along the river as well. In 1759, Jacobus Vanderveer, Sr. died and the property was willed to his son, Jacobus Vanderveer, Jr. Sometime between 1772 and 1775, Jacobus Vanderveer, Jr. constructed a new home on the property for his wife, Winche. His wife and their only child, Catherine, died in 1777, leaving Jacobus alone in his new home. The original footprint of the Vanderveer House consisted of a one-and-a-half story, three bay, frame structure with a kitchen wing attached to the west end. The house was two rooms deep and included two fireplaces, both of which exist today. The current hallway was divided into two rooms, still evident by the direction of the floorboards and the exposed wall which shows where walls once existed. The front door was located on the south side of the home, to take advantage of the full sun and light in the winter. The original 1770s parlor with fireplace and cabinet. During the winter of 1778-1779, General Henry Knox took residence in the Vanderveer House with his wife Lucy and their daughter "Little" Lucy. Lucy was in the late stages of pregnancy while at the Vanderveer House and gave birth to a daughter named Julia, who died shortly after birth. She was one of nine children that did not survive to adulthood. Julia's death caused a commotion in the Dutch Reform Church, which refused to bury her in the church's cemetery because their family was not a member of the church. Additionally, the clergy felt that it was possible she may have been possessed by a demon. According to local tradition, she was buried on grounds donated by Jacobus Vanderveer where he buried his own infant daughter just two years prior. The land where these children are buried are now part of the cemetery to the north of the Vanderveer property. While at the Vanderveer House, General Knox supervised the establishment of the Pluckemin Catonment, a military training academy. The Cantonment was located to the south and east of the Vanderveer House. 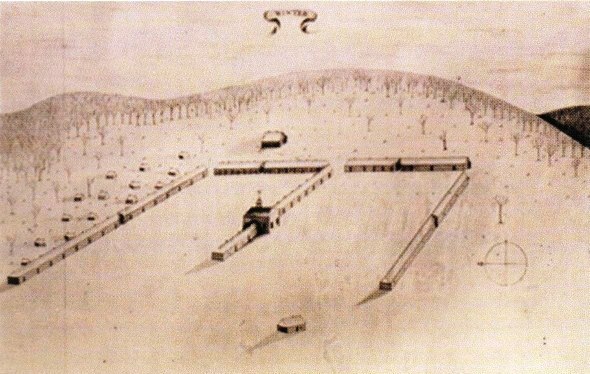 The facility was E-shaped, and served three purposes: housing the artillery troops and officers and camp followers, creating new weapons to resupply Washington's army, and training the artillery forces. A large building at the center of the "E" was used as a classroom, providing classes to officers each day on the techniques and details of using new weapons and ordnance. The Cantonment was America’s first military training facility, precursor to the US Military Academy at West Point, established in 1802. After the winter of 1779, the buildings remained in use as a military hospital into 1780. There is no evidence of the buildings being used after that and most likely fell victim to neglect and were slowly regained by nature. It was not until the 1970s that the site was rediscovered when a history student wrote a master's thesis about General Knox and the Continental Army’s winter cantonment at Pluckemin. The thesis sparked an interest in the site and over the course of ten years (1979-1989), an archaeology project was coordinated that yielded over 190,000 objects. Roughly 19,000 of the archaeological finds are currently in the process of being cataloged through a grant from Somerset County. The Pluckemin Artillery Cantonment was added to the State and National Registers of Historic Places in 2008 and 2009, respectively. After the Revolution, Jacobus married Maria Hardenburgh, the daughter of a prominent clergyman of the Dutch Reformed Church. Together they had three children that survived to adulthood: Henry, Dinah, and Phebe. After Jacobus' death in 1810 at the age of 66, the house was inherited by Henry S. Vanderveer, his son. At the time, Henry was 23. About the same time, he married Francis Nesbitt and began building an addition on the east side of the property. The addition consisted of two rooms built in the Federal Style, reflecting how the Vanderveers had assimilated themselves in American culture and shied away from their ancestral Dutch traditions. However, Henry never saw the rooms completed. He died in 1813, only three years after inheriting his father's estate. His widow and young daughter Maria left the property and never returned. The inventory of Henry's estate included five enslaved workers; a man, woman, and three children. They may have been a family although no records currently exist that verify this. It was not uncommon for the Dutch to own slaves. Documents indicate that even Jacobus Vanderveer inherited one slave named June from his father's estate. During his lifetime, he may have had as many as six slaves at one time. In his will, he left two slaves to his granddaughters. Between 1830 and 1832, Margaret Mellick and her husband Abram Huff rented the property. In 1833, Mary Hardenburg Vanderveer sold the property to Dr. Henry Vanderveer. After Dr. Henry Vanderveer's death in 1868, his will was disputed and by 1875 his property was sold at auction. During the dispute, it appears that Israel Schenck, one of Dr. Vanderveer's nephews, had been in charge of and rented out the property. In 1875, Henry Ludlow purchased the property at auction. Henry and his wife Augusta, along with two wards and two servants lived in the house. The Ludlow's farmed roughly 120 acres of land surrounding the house. The Ludlow's made one very significant change to the house circa 1875. The original 1770s kitchen wing on the north end of the house was removed for reasons unknown. Historians conjecture that it may have been extremely dilapidated or it may have suffered some significant damage late in the nineteenth century. A new wing was built in its place and divided into four rooms. At the same time, a new porch spanning three bays was added to the southern entrance to the home. In 1909, the house was sold to Frank A. and Frederick E. Ballentine, who were known to be involved in real estate. The Ballantines dramatically changed the home and made many improvements, perhaps in the hope of reselling the home for a profit. Stucco was applied to the exterior and a large porch with square columns and a porte cochere was added to the north side of the house, essentially relocating the front entrance from the south side to the north side. The current stairwell in the home was also built, replacing the earlier staircase at the former front entrance. During this time, plumbing was added to the house, steam heat installed, new windows were installed, and dormers were built on the second floor. On March 21, 1916, the home was sold once again to Grant B. Schley, who died one year later. After his death, the property passes to his son, Kenneth B. Schley, Sr. Kenneth B. Schley, Jr. retained ownership of the home and rented it to various tenants through the 1980s. 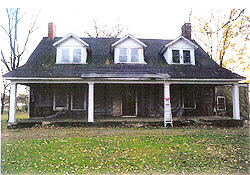 The Vanderveer property was purchased by Bedminster Township in 1989. The house was placed on the National and New Jersey Registers of Historic Places in 1995. A large-scale restoration project began around 2000 to transform this once-important home back into the Dutch and Federal-style home that once existed. The stucco, dormers, and porches were removed, windows and doors were replaced and relocated to their original fenestration, the original roofline was rebuilt, and the original floors were uncovered. In 2007, the 1770 kitchen wing was reconstructed over the original footprint. Today, the kitchen wing serves as an orientation and welcome area to the house, providing for handicap access to the rest of the structure. There are a long lists of "firsts" for New Jersey, but many sources neglect to mention the Puckemin Catonment, America's first military training academy. Despite the Vanderveer House being the only remaining building associated with the site, over 190,000 artifacts have been uncovered, demonstrating the importance and the countless possibilities for interpretation and display. The continued preservation of the simple, yet elegant Dutch house where Knox and his family resided, and the renewed interest in the training academy he commanded, would make General Henry Knox proud as he reflected upon his accomplishments during the Revolutionary War. Thanks for a thorough and comprehensive history of the Vanderveer House. Very readable and most interesting.